To Read the Paper Please Click HERE!!! This project is Chap Research’s first research paper. The purpose of the paper is to determine the applicability of 3D printed sprockets for load bearing industrial applications — an area dominated by metal sprockets. 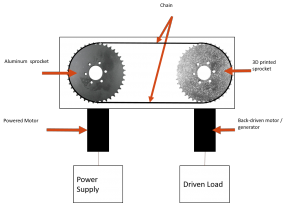 The study varied a range of sprocket design parameters and evaluated whether 3D printed sprockets could withstand the torsional stresses and fatigue failure modes in these applications. This project also involved the development of two distinctive custom test rigs, one for characterizing torsional stress and another for fatigue stress analysis. The study also shows the relationship between the load applied to a 3D printed sprocket and the number of cycles of continuous operation before a fatigue load related failure occurred and makes a conjecture on a range of load for “infinite life” operation of a sprocket. Our study concluded that 3D printed sprockets were sufficient for our targeted load bearing application in robotics. Layer height and infill settings have the largest impact on the performance. The most surprising finding of the study was that 3D printed sprockets performed better than metal sprockets for operation under fatigue stress. In summary, the study demonstrates that 3D printed sprockets should be adequate for a wide variety of applications. Vary sprocket design and manufacturing parameters and determine torsional and fatigue stress performance. Our approach consisted of 2 testing rigs. One testing rig tests the torsional load performance and the other tests the fatigue life performance. A variety of key sprocket design and operating parameters exist in the real life applications that influenced our study. These parameters include the loads managed, sizes of sprockets needed, and the printer’s manufacturing settings. 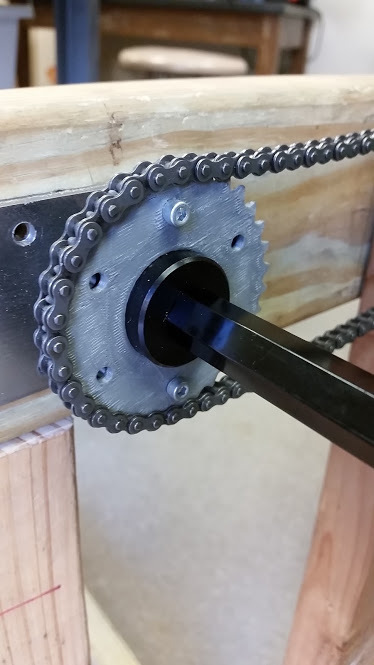 For this test, we created a set of sprockets and tested them across different parameters in order to determine the effect of those parameters on the torsional strength of the sprocket. Every sprocket created had the same overall thickness and we adjusted the number of layers to accommodate thinner layers. A design of what the testing rig looks like can be seen to the left. For this test, the goal was the characterization of sprockets across load tests parameters to determine the effect of those parameters on the fatigue strength of the sprocket. The test apparatus to the right illustrates the test apparatus built for this purpose. The power supply provides a 12 V source that drives the powered motor, which in turn drives the aluminum sprocket. The metal sprocket then drives a 3D printed sprocket that is connected to a back driven motor. 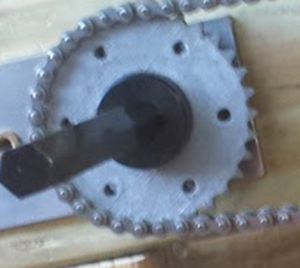 The back driven motor serves as a generator (G) and so the 3D printed sprocket effectively generates current. 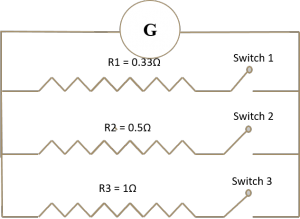 Banks of resistors connected in parallel serve as a load and draw current from this generator and effectively emulate a robot drive load. We set up a bank of 1 Ω, 0.5 Ω and 0.33 Ω resistors from which we created resistances ranging from 0.167–1.000 Ω. 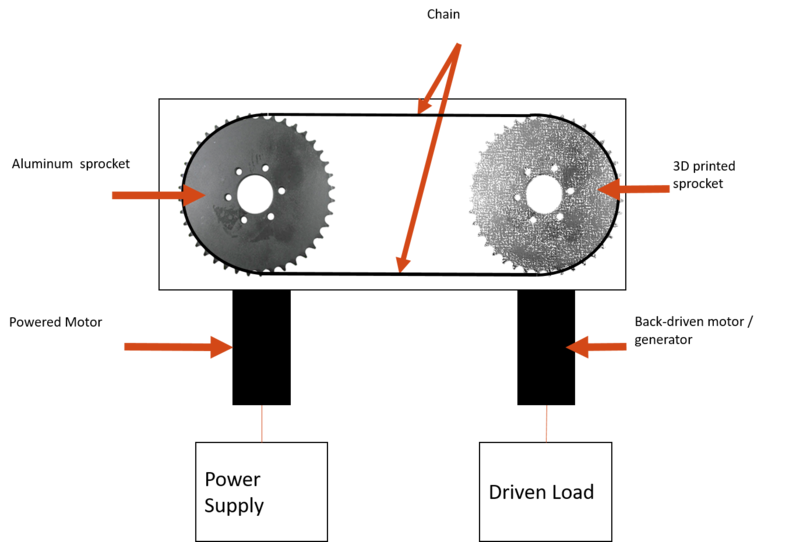 The range of resistances emulates a broader array of load bearing scenarios across which we then tested the relative fatigue stress performance of sprockets. A wire frame image of the resistor bank can also be seen to the right. 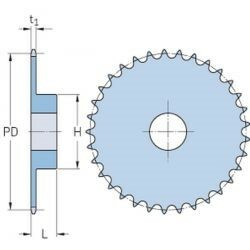 The size of the sprocket has only a modest to insignificant impact on the torsional stress load that a sprocket can bear. Torsional failure loads with 100% infill and 12 layers across small, medium, and large sprockets are shown in the first graph. The most significant infill impact was on sprocket torsional stress failure. The second graph plots the torsional failure load for medium-size sprockets with 12 layers and infill ranging from 10–100%. The number of layers positively affects the amount of torque a sprocket can hold, as shown in the third graph, it appears to level off around 20 layers. The third graph plots the torsional failure point for medium-size sprockets at 100% infill while varying the number of layers (which is the inverse of layer height). We were able to estimate zone of infinite life and trade off against # cycles. The trade off id characterized in the graph to the right. These sprockets will have lesser fatigue load related failures for standard operations even compared to metal sprockets. To read the paper please click here!